Synthetic peptide within Human PSCA (extracellular). The exact sequence is proprietary. Bladder carcinoma and Prostate carcinoma. Our Abpromise guarantee covers the use of ab15169 in the following tested applications. PSCA (Prostate Stem Cell antigen) is a cell surface antigen, which is overexpressed in ~40% of primary prostate cancers and in as many as 100% of metastatic ones. PSCA is also overexpressed in a majority of transitional cell and pancreatic carcinomas. Antibody directed against PSCA inhibits tumorigenesis, slows tumor growth, prolongs survival and prevents metastasis in a preclinical zenograft model indicating that PSCA may have utility as a prognostic marker and/or therapeutic target in prostate cancer. 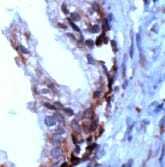 ab15169 staining PSCA in human breast carcinoma by Immunohistochemistry (Formalin/ PFA fixed paraffin embedded tissue sections). Publishing research using ab15169? Please let us know so that we can cite the reference in this datasheet. There are currently no Customer reviews or Questions for ab15169.